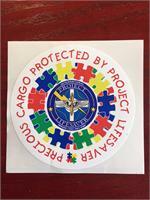 Welcome to the Project Lifesaver International online store. Please select a category in the left column to see our products catalog. 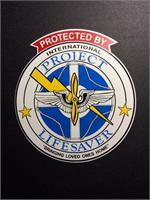 Project Lifesaver International - "The Experts that Bring Your Loved Ones Home". A non-profit organization founded by Public Safety Officers FOR Public Safety Officers. A CAREGIVER'S GUIDE TO WANDERING. PLI-PR1 Perimeter Home Safety System: 1 PLI-PR1 Perimeter Receiver, 1 PLI-1000 Receiver, 1 CS 30 day 216 MHz Data Transmitter (DTM) kit (12 batteries, 12 bands, 1 tester), manual, 1 ac power cord. Transmitter pre-set to communicate with PLI-PR1 receiver. Project Lifesaver white "T" Shirt - white in color with Project Lifesaver logo on front of shirt and special pictures on the back. Lapel Pin created exclusively for and only available through Project Lifesaver International made for Retired Law Enforcement Officers. Questions or Comments about this website? Contact us via the Contact Us Link! Copyright 2004-2009. 43rd SAR/Search and Rescue Project Lifesaver. All rights reserved.